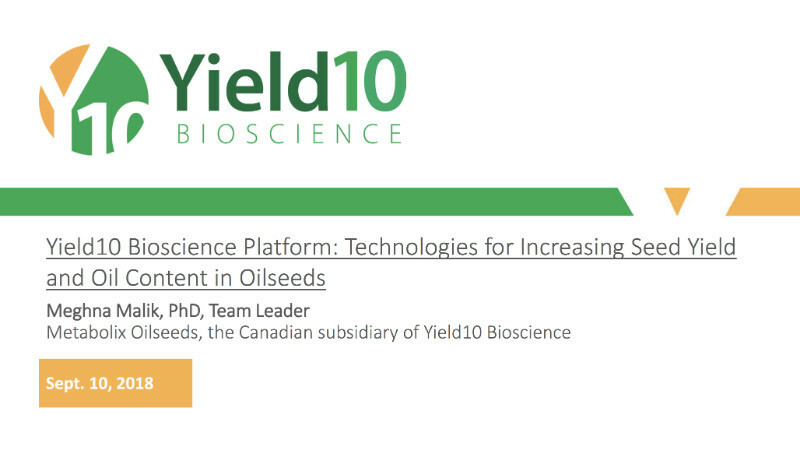 Yield10 Bioscience is an agricultural bioscience company focusing on the development of disruptive technologies to produce step-change improvements in crop yield for food and feed crops to enhance global food security. Experts forecast that food production must be increased by over 70% in the next 35 years to feed the growing global population, which is expected to increase from 7 billion to more than 9.6 billion by 2050. Yield10 is focused on new agricultural biotechnology approaches to improve fundamental elements of plant metabolism through enhanced photosynthetic efficiency and directed carbon utilization. Yield10 is working to develop, validate and commercialize new traits and identify gene editing targets in several key crops including canola, soybean and corn. Yield10 was launched by Metabolix, Inc. in 2015 and is traded on Nasdaq (YTEN). Yield10 is headquartered in Woburn, MA and has an additional agricultural science facility with greenhouses in Saskatoon, Saskatchewan, Canada. Here’s the latest from the company on its promise and progress.